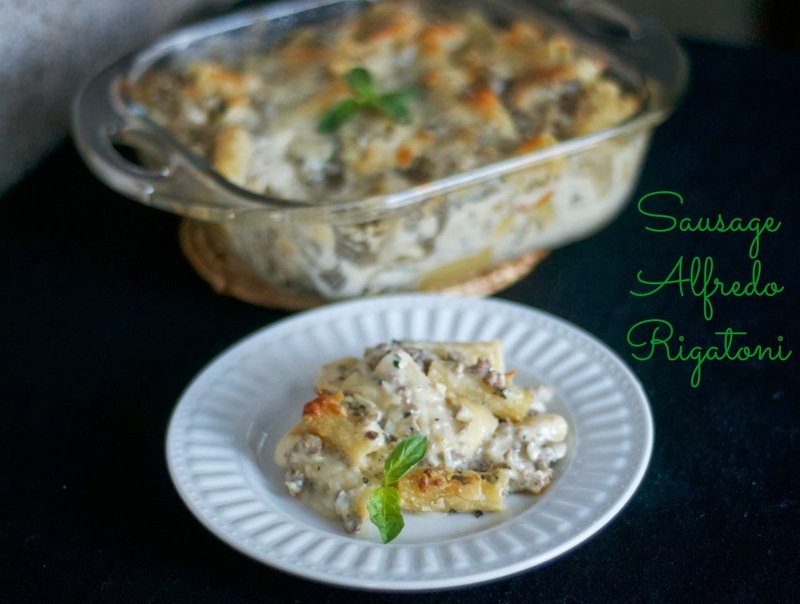 Sausage Alfredo Rigatoni – a rigatoni pasta baked with sausage mixed with fresh basil and tossed in a roasted garlic Alfredo sauce. Can I just tell you how excited I am that this recipe came together and we didn’t have to order out for pizza? 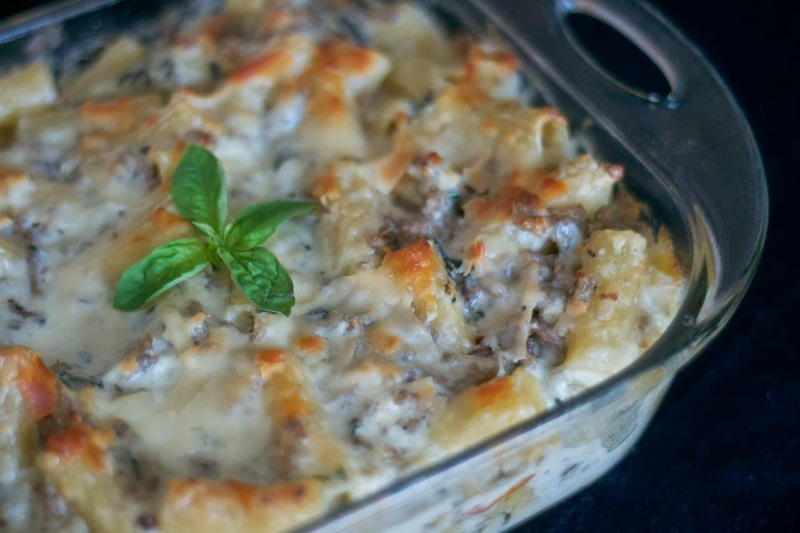 I wanted to make a baked Alfredo dish with a meat, but without using our standard chicken fare. We eat chicken quite a bit. We like it, but sometimes we need a little change. And I never make anything with sausage. Cook that sausage up with some garlic and an onion. Mix in the basil and place into a bowl until sauce is ready. That wonderful roasted garlic Alfredo sauce. Preheat oven to 350 degrees F and prepare an 8 X 8-inch baking dish by spraying it with cooking spray. 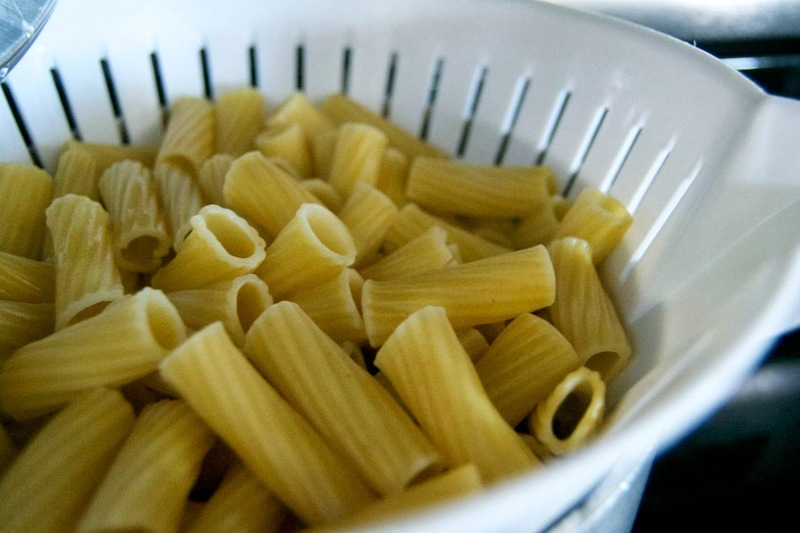 Cook rigatoni according to package directions in salted water, cooking to al dente. Set aside. In a large skillet over medium-high heat, saute onion and minced garlic in olive oil until translucent. Add sausage and heat until thoroughly cooked. Remove from heat and stir in basil, and salt and pepper to taste. 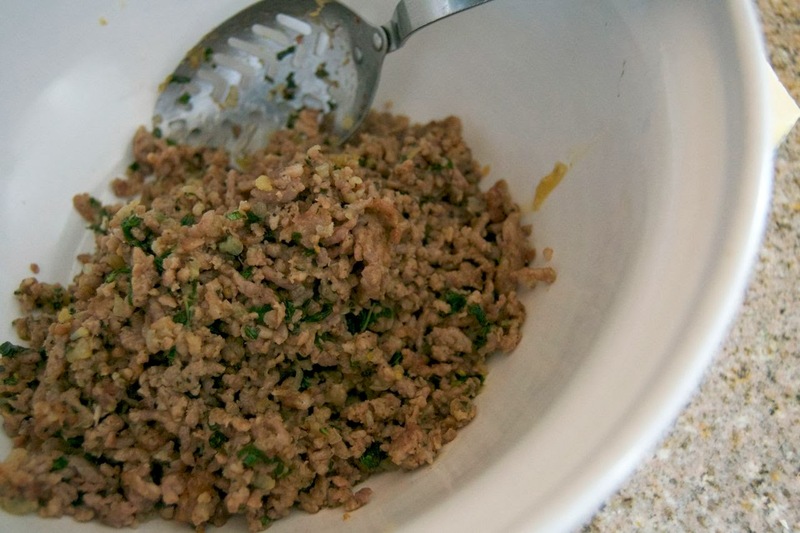 Place sausage mixture into a large bowl. To prepare the Roasted Garlic Alfredo Sauce, begin by removing the cloves of garlic by gently squeezing them from the skins and place into a small bowl. With a fork, mash the cloves. 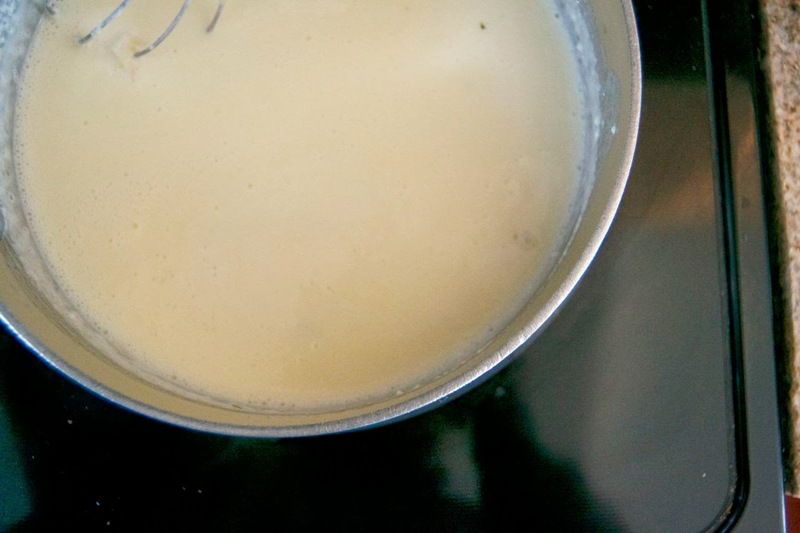 Melt butter in a medium size saucepan. Remove the cloves of garlic by gently squeezing them from the skins and place into a small bowl. In a small saucepan, on low to medium heat, melt the butter. Add the cream and roasted garlic, and heat to very warm, but DO NOT boil. 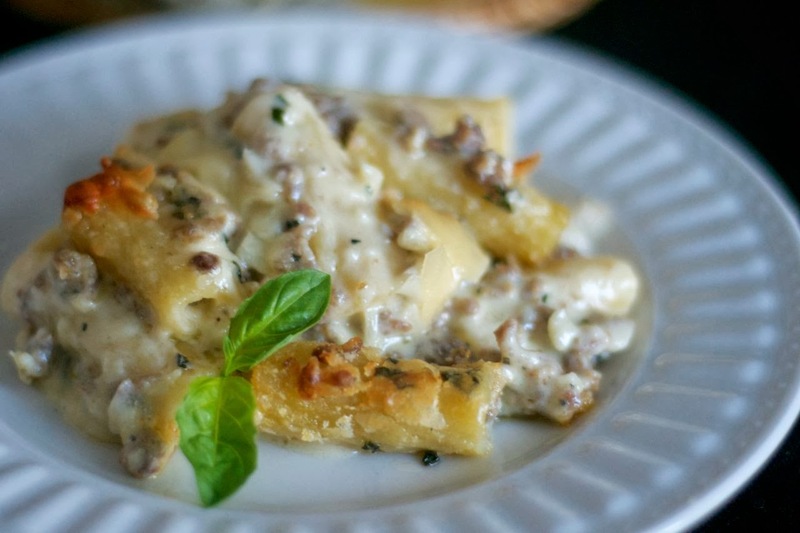 Mix the Parmesan cheese, salt and pepper, whisking constantly until cheese has melted. Mix in the cream/flour mixture, stirring and heating until mixture thickens. Pour sauce over sausage mixture and stir to combine. Add rigatoni and mix thoroughly. Pour contents into prepared baking dish. Bake for 30 minutes until bubbly and lightly browned. I rate everything I bake on a scale from 1-4 with 4 being the best and this Sausage Alfredo Rigatoni earned 4 rolling pins! This was, as Mr. 365 said,….well, you’ll have to watch today’s video. haha, we really liked it. A LOT. I’ll definitely be making it again. Hi! Would love to try this recipe, but I have zero time in my life these days. 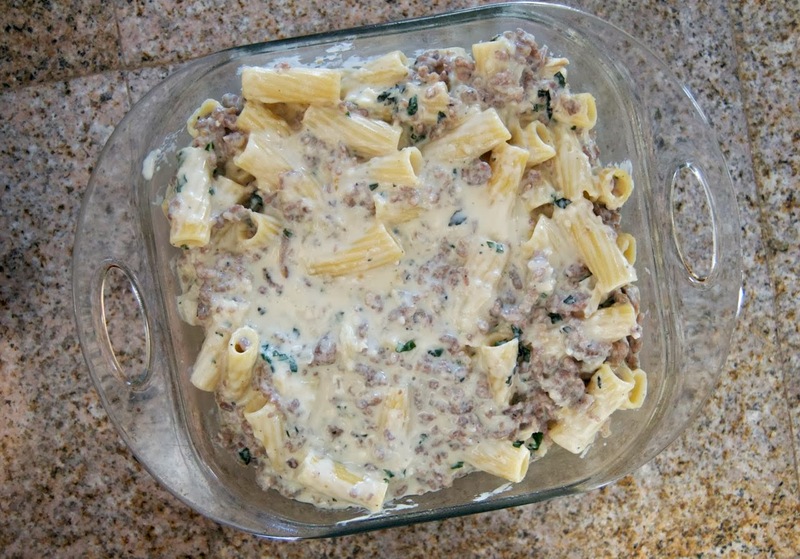 Curious…do you think I could sub jarred Alfredo for this recipe? ?